Foothills Regional Landfill site near High River, Alb. on Aug. 7, 2013. 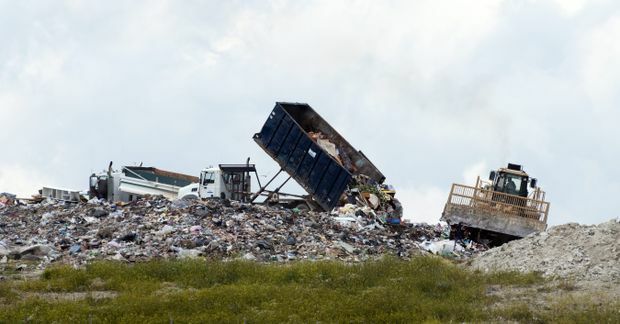 More than half of all food produced in Canada is wasted, with the food industry putting the vast majority of it into landfills, according to a new study. The study to be released on Thursday shows that the level of food waste in Canada is far worse than previously believed, with 58 per cent of all food produced either lost or wasted. It also finds that the vast majority – 86 per cent – takes place within the food industry and not in households, as previously thought. second harvest; value chain management inc.
Mr. Gooch, the chief executive of Value Chain Management International, is the leading expert on food waste in Canada and the author of several previous studies on the subject. His previous work had only measured the waste in Canada based on value – $31-billion each year. The Food and Agricultural Organization (FAO) of the United Nations, meanwhile, has in the past estimated that worldwide, about one-third of food goes to waste. The difference between his earlier studies and this one, Mr. Gooch said, is that in the past, he did not have access to good data, especially from the private sector. In some cases, they relied on data gathered by the industry not specifically for the purpose of measuring food waste. In many other cases, he said, waste wasn’t measured at all. (The FAO figures, for example, do not include most meats or grains, while the Canadian study does). This time around, Mr. Gooch said, his team was able to work directly with companies along the food chain to measure waste for themselves – in weight, and not just value. They also interviewed more than 700 experts in the food industry to understand where waste was coming from. In recent years, the dominant belief has been that households are to blame for much of the waste – a belief based in large part on Mr. Gooch’s past work. His 2010 study, for example, found 51 per cent of waste took place in households. As a result, governments and researchers have focused many of their resources toward public education. The “Love Food Hate Waste” campaign, for example – an import from Britain designed to inspire average citizens to do their part to avoid waste – was recently introduced in both Vancouver and Toronto, in partnership with local governments. But this new study shifts the responsibility to the food industry. The study finds that food processing contributes 34 per cent of waste, followed by production (24 per cent), manufacturing (13 per cent), retail (4 per cent) and distribution (2 per cent). Hotels, restaurants and institutions contribute 9 per cent of waste. Households, meanwhile, produce just 14 per cent of the total. At the production level, the study says, farmers often discard fruits or vegetables considered “imperfect.” Products are also often thrown out based on overly conservative best-before dates, applied by companies “to protect their brand and manage consumer perceptions of the product’s quality." Some of this food is diverted for use as animal feed or fertilizer. Some, too, is donated to food banks – although many companies avoid it based on misconceptions about the donation process – but much of it is simply thrown out. Aside from the economic implications, the problem has major environmental repercussions. Producing food requires land, water and fertilizer, and using these limited resources only for the food to wind up in landfills is unfortunate, she said. Food that winds up in landfills, meanwhile, releases methane, a greenhouse gas that contributes to climate change.